Little Cat A has been on TV and computer restriction. This has caused her to look for other sources of entertainment. Lots of painting and reading have been happening in her life. Last weekend she focused on 3-D art. She rummaged through my ribbon stash, got inspired and went to work. I thought what she came up with was so clever I told her I'd blog about it. She blushed. You can click on photos to enlarge. She searched the web for a dog outline. Enlarged it on our printer. Glued eyelash ribbon like crazy. Coiled bits of pipe cleaner for the eye and nose. 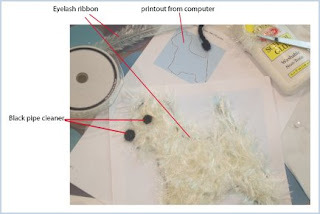 Added blue ribbon and bit of tinsel pipe cleaner for the collar and tag. Such a clever girl! That is DARLING! Talented girl, takes after her mother. 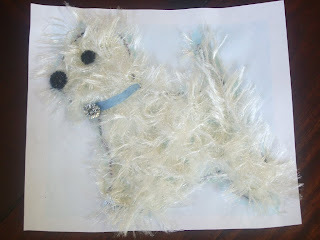 I am the proud owner of two Westies, and I think your project is just dandy! You have a creative mind, which is great. City Chic Country Mouse are in Etsy's Storque! !